Game 1 Despite having a toe injury earlier, Scottie Pippen helped the Bulls to a 84-82 win over Utah on Sunday night. Pippen scored 27 points while Jordan scored 31. The Bulls trailed 79-78 in the fourth quarter, yet were able to come back after Pippen blocked Antoine Carr's jump shot and after an assist from Ron Harper when Pippen would make his third 3-pointer of the night. With the game tied, and only seconds remaining, Karl Malone, whose nickname was "The Mailman" (because "He delivers"), was fouled and had a chance to give the Jazz the lead. Scottie Pippen famously psyched him out by telling him "Just remember, The mail man doesn't deliver on Sundays, Karl." while Malone was at the free throw line. He missed both free throws and the Bulls rebounded and quickly called a time-out. With the game on the line, Chicago put the ball into the hands of Michael Jordan. M.J. dribbled out most of the waning seconds and then launched a 20 footer that swished in at the buzzer, as the Chicago Bulls took the first game of the 1997 NBA Finals. The Chicago Bulls simply dominated Game 2. Jordan scored 38 points. After a hard fought first quarter, the Bulls took control of the game with a 12-0 run in the second quarter with Michael Jordan whipping a great pass to Scottie Pippen for a one handed dunk. The Jazz's 31 points in the first half was only one point above an NBA low. Karl Malone, who missed two key free throws in the last game, would have another bad night, going only 6 for 20 shooting. Dennis Rodman nailed a late 3-pointer to put the Bulls up 97-83. The game gave the Bulls a 2-0 lead. The Chicago Bulls would start off the first three quarters with mediocre play, despite Scottie Pippen tying the NBA Finals record with seven 3 pointers. Utah was led by Karl Malone who scored 37 points and had 10 rebounds. Chicago attempted a 4th quarter comeback cutting a 24 point deficit to 7, but ultimately Utah would win their first game of the series. The Jazz fans welcomed their proud Western Conferences champs with force. During the starting lineups of the Jazz, the Bulls players plugged their ears, due to the loud cheers and fireworks within the Delta Center. With the Bulls trailing by 24 points in the second quarter Michael Jordan threw down an alley oop slam which drew loud boos from the crowd. Due to the extremely loud Jazz fans in game 3, Bulls Coach Phil Jackson wore a pair of ear plugs. A tight game with many lead changes throughout, the Jazz led by 5 at quarter time and trailed by 5 at halftime; the score was tied going into the fourth quarter. Late in the game, Michael Jordan dunked to give the Bulls a 71-66 lead, but John Stockton made a momentum-shifting 3-pointer at the top of the key to cut the Jazz' deficit to 71-69. Jordan made a jumper to give the Bulls a 73-69 lead, but the Bulls would not score again. The Jazz pulled to within 1 when Stockton stole the ball from Jordan and made 2 free throws at the other end. On the next possession John Stockton grabbed a rebound from a Jordan miss and threw a full court pass to Karl Malone for a layup which put the Jazz in front for the first time since early in the fourth quarter 74-73 which sent the crowd crazy. After some Bulls misses, Karl Malone made two free throws with 17 seconds left to put the Jazz up by 3 points. 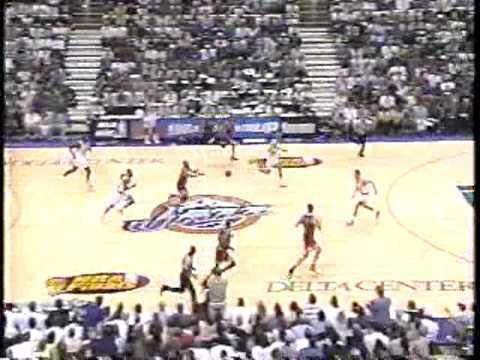 On the next possession, Michael Jordan's potential game-tying 3-pointer rattled in and out; Stockton grabbed the rebound and threw another full court pass to Karl Malone, who escaped the intended foul and dunked. The Jazz's 12-2 run tied the series at two games apiece. The Jazz fans grew so loud during the final moments of the game when Bryon Russell scored the last dunk, that NBC Sports announcer Marv Albert was unable to be heard clearly or understood. The 78-73 score was one of the lowest scores in NBA Finals history. Game 5, often referred to as "The Flu Game", was one of Michael Jordan's most memorable. Just 24 hours earlier, on June 10, 1997, Michael Jordan woke up nauseated and sweating profusely. He hardly had the strength to sit up in bed and was diagnosed with a stomach virus or food poisoning. The Bulls trainers told Jordan that there was no way he could play in the game. The Jazz had just won two in a row to tie the series, and Chicago needed their leader in this critical swing game, which is crucial in the NBA Finals 2-3-2 format, which Game 5 is the most important game with the winner being one game away from the NBA Title. Against all odds, Jordan rose from bed at 3:00 p.m., just in time for the 6:00 tip-off at the Delta Center. Jordan was visibly weak and pale as he stepped onto the court for Game Five. At first, he displayed no energy whatsoever, and John Stockton, along with reigning MVP Karl Malone, quickly led the Jazz to a 16-point lead. But in the second quarter, Jordan started to sink shots despite lacking his usual explosive speed and hardly being able to concentrate. He scored 17 points in the quarter as the Bulls hit the front with a furious rally before halftime. The Jazz though reclaimed their lead and pushed it to 8 points early in the second quarter. But the Bulls went on a 10-0 run to take the lead again and the game would remain tight the rest of the way. Luc Longley and Scottie Pippen did their best to keep the Bulls in the game while Jordan was fatigued again in the third. But Jordan turned it on again, scoring 15 points in the fourth quarter. With less than a minute to go he was at the free throw line, he made the first but missed the second. But Toni Kukoc tapped the offensive rebound to Jordan, who would swish a three-point shot to put the Bulls up by three points with less than a minute left. Chicago then withstood a late Utah push and held on for a narrow victory when John Stockton missed the first of two free throws in front of the stunned crowd with an exhausted sweat-soaked Jordan briefly throwing two fists into the air as the buzzer sounded. Jordan talking to the media after the game quoted "we wanted it real bad." Jordan finished the game with 38 points, seven rebounds, five assists, three steals and one block. Malone was the highest-scoring Jazz player with 19 points but suffered from some dreadful shooting, throwing up an off balance airball on the possession prior to Jordan's big 3. Malone would finish the second half 1 for 6 from the field. Jordan stayed on the court for 44 minutes, resting for only four minutes while being perpetually at the brink of fainting. 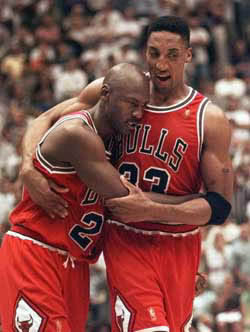 With only a few seconds remaining and the game finally in hand, Jordan collapsed into Scottie Pippen's arms. Michael Jordan was not fully recovered from the flu, but was feeling much better and led the Bulls with 39 points. Chicago struggled in the first half scoring just 37 points and 9 of 27 from 2 point range With the Bulls struggling in the third quarter Michael Jordan dunked after a steal, bringing the crowd to its feet and Jud Buechler buried a great 3 point shot to help give the Bulls the momentum. The Bulls trailed by 9 points early in the fourth quarter but went on a 10-0 run to take their first lead since the opening minutes when Steve Kerr hit a 3-pointer, but the Jazz would regain the lead and the game will remain one possession until the final score. In the final minutes, Jordan's fadeaway on the baseline put the Bulls up by 3, before Bryon Russell hit a three-pointer to tie the game at 86-86. The two teams would fail to score on their next possessions. With 28 seconds left after Shandon Anderson missed a reverse layup, the Jazz expected Jordan to take the final shot. Instead, Jordan passed off to Steve Kerr, who hit a jumper with 5 seconds left to send the United Center crowd into a frenzy. 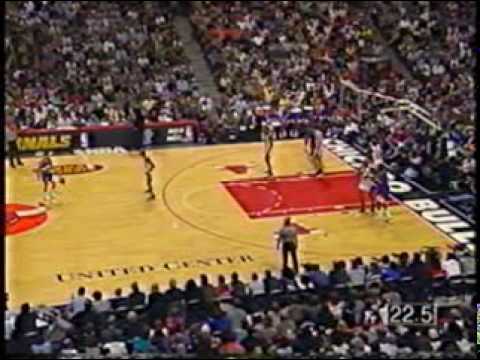 The Jazz looked for one final shot to stay alive, but Scottie Pippen made a massive defensive play as he knocked away Bryon Russell's inbound pass intended for Shandon Anderson and was able to pass the ball over to Toni Kukoc, who dunked the final 2 points of the game before the roaring crowd to bring the Finals to an end. Afterwards, Jordan was named the NBA Finals MVP. A courageous, classic performance by the flu-ridden Michael Jordan. — —Marv Albert after Michael's improbable performance in Game 5, which gave the Bulls a 3-2 series lead. What more could Michael Jordan do? He already had led the Chicago Bulls to four championships, winning Finals MVP honors each time. He owned nine NBA scoring titles, four MVP awards, two Olympic gold medals and a host of additional honors and records, yet the 1997 NBA Finals would provide a platform for him to add to his amazing story. Jordan had been dethroned as MVP by Utah's Karl Malone during the 1996-97 regular season, but the Finals matchup between the Bulls, a league-best 69-13 in the regular season, and Jazz, a franchise-best 64-18, gave MJ an opportunity to reclaim his position as the game's premier player. He remembers waking up in the middle of the night, sweating profusely, shaking, and feeling as if he was going to die. "I was scared; I didn't know what was happening to me," Michael Jordan would say. At first, he thought it was a nightmare. Then he realized it was real, that he was seriously ill. "I felt partially paralyzed," he would later say. When he lifted himself up from his bed in his Utah hotel room, his head began spinning. He'd never been so nauseated before. He feared that somehow, some way, someone had slipped some kind of drug in something he ate.